She's been hard at work in London on her 13th studio album, The London Sessions. And Mary J. Blige was pictured out promoting her project in the British Capital on Friday, leaving the BBC Radio 1 studios after appearing on Annie Mac's show. The Just Fine hitmaker appeared edgy chic in a furry black vest, skintight black jeans, and knee-high stiletto boots. The 43-year-old musician added some contrast with her white turtleneck sweater and glammed up the look with her giant hoop earrings. 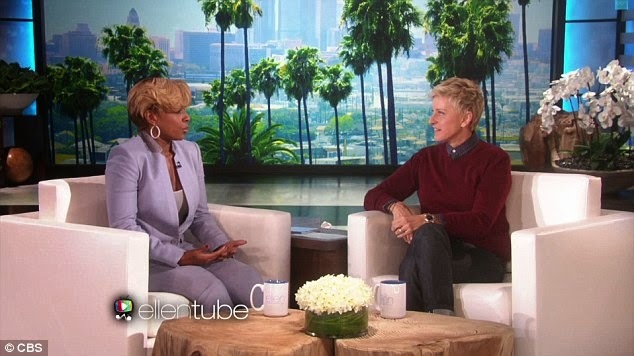 The day before, a performance of her new song Right Now aired in the U.S. on The Ellen DeGeneres Show. 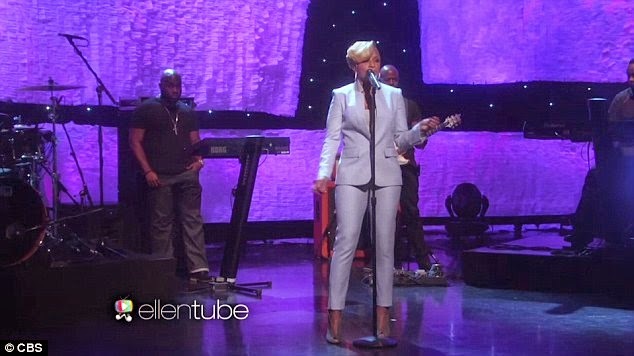 Mary was looking sleek and chic in a form-fitted lavender pantsuit and hoop earrings. She has been in London recording her new album, which was created after 10 days of writing and 10 days of recording. It features some of the hottest British musicians, including the likes of Sam Smith, Disclosure, and Naughty Boy. The London Sessions leaked online in its entirety on October 26 – ahead of its November 24 UK release date and December 2 US release date. The Breakthrough sold 727,000 copies in its first week in 2005 before going on to sell seven million copies worldwide. Mary can next be seen performing at the 2014 American Music Awards, airing live on Sunday, November 23 – alongside the likes of Taylor Swift, One Direction, Selena Gomez, and Iggy Azalea. She has also been nominated for Favourite Female Soul/R&B Artist – competing against Beyonce and Jhene Aiko.